Something horrible is happening in Sydney: Our city centre is being destroyed; not by terrorists … but by our state government, who behaves like terrorists. 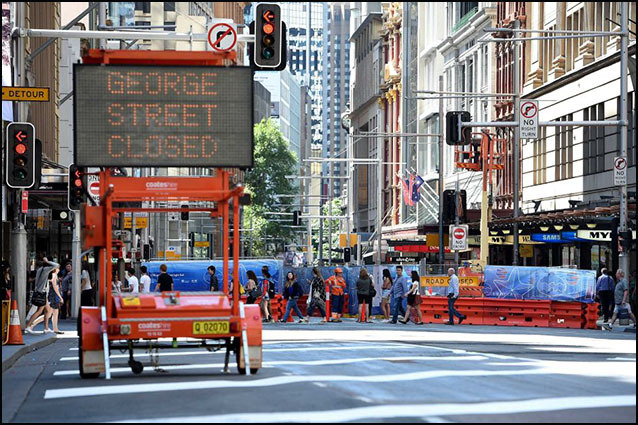 Has there ever been a more monumental f***up by a state government than the digging up and utter destruction of Sydney’s George Street? For what? To see street cars running in tracks, fed their energy from overhead cables? One can hardly come up with a more retrograde, sooo-last-millenium concept if one tried. Was there nobody those years ago who said to the powers that were by the time the project would be finished it would be hopelessly out of date? Trackless trams anybody? Battery powered buses? Probably self-driving? Oh the folly of it, the idiocy, the colossal waste of money. 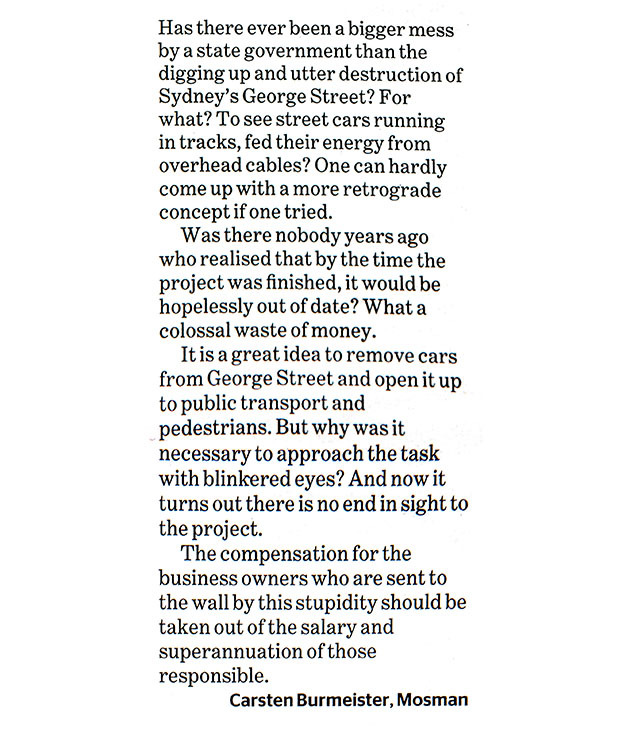 Of course it is a great idea to remove cars from George Street and open it up to public transport and pedestrians. But why was it necessary to approach the task with blinkered eyes, gaze firmly averted from new, modern, innovative technology that was clearly on the horizon when that disastrous decision was made to dig up the street? And now it turns out there is no end in sight to the project. The compensation for the business owners who are sent to the wall by this stupidity should be taken out of the salary and superannuation of those responsible.